ALWAYS review and follow the directions on the label. The below instructions are a general overview, meant to accompany the reference photos. ENSURE you follow all safety precautions including wearing protective eyewear and gloves. 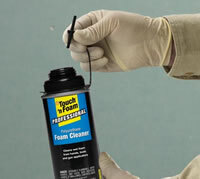 Insert attached adapter into valve opening and press to dispense a small amount of Foam Cleaner to a cloth for cleaning tools and gun baskets. 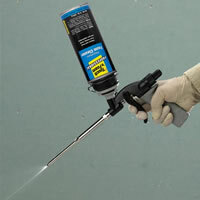 Attach Foam Cleaner can to your gun and spray as you would any gun foam to thoroughly clean your applicator gun. 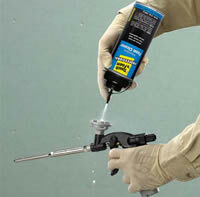 Spray until the spray is clean and clear of foam.